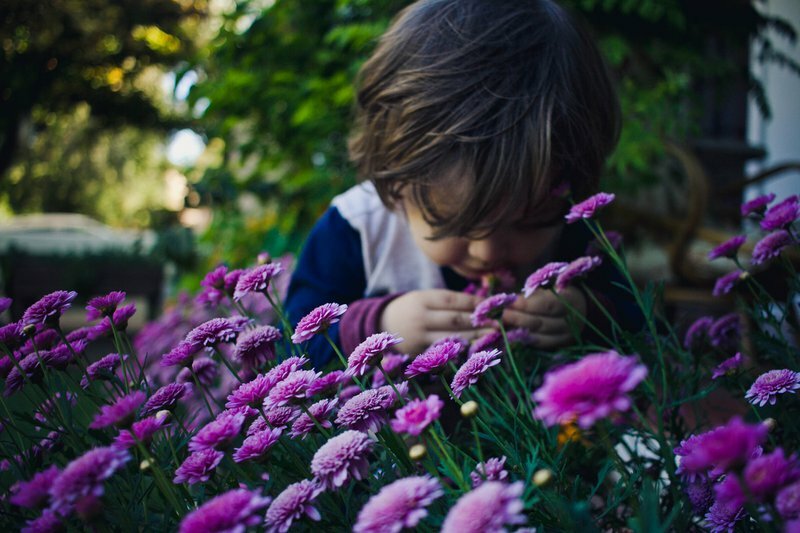 Whether it is gardening, building forts, stacking blocks, playing at the water table, or lining up by height in the classroom, children demonstrate a clear readiness to engage in science, technology, engineering, and math (STEM) learning early in life. STEM Starts Early is the culmination of a deep inquiry supported by the National Science Foundation including: interviews with policy makers, researchers, and teacher educators; focus groups with preschool and elementary school teachers; an analysis of research funding in the area; and an extensive literature review on the latest research about early STEM learning. 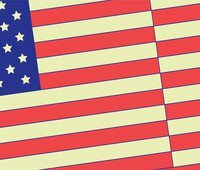 The initial findings were shared with leaders from policy, research, and education at a two-day agenda-setting convening at New America, and their input was then incorporated into the report released today. Efforts involving STEM (as well as STEAM, which includes the arts) have been gaining momentum around the country. In addition to raising awareness of STEM education needs at middle and high schools, a crop of research specialists and early childhood advocates has been focused on STEM in the early years. Last year, researchers established the DREME Network, which stands for Development and Research in Early Math Education, and earlier this month, the Early Childhood STEM Working Group published Early STEM Matters. Other system-building initiatives include: 100K in 10, focused on building a highly qualified STEM workforce; the Teaching Institute for Excellence in STEM (TIES), which fuels STEM education curriculum and instructional program development; Change the Equation, an alliance of business and policy leaders devoted to promoting STEM education; and CS4All, an effort launched by President Obama and the National Science Foundation to ensure that every child masters computer science as a gateway skill. These promising initiatives point to a converging consensus among practitioners and policymakers and are the first step in creating a web of charging stations for young children, ensuring that they can power up their learning anytime, anywhere. Initiatives like STEM Next work to engage kids in STEM everywhere, and high-quality media are being used to support teachers in the classroom (e.g., STEM from the Start), parents at home (e.g., Bedtime Math), and home-school connections using multi-media (e.g., Ready to Learn’s transmedia suites). Researchers and educators agree: Children demonstrate a clear readiness to engage in science, technology, engineering, and math (STEM) learning early in life. And, just as with language and literacy, STEM education should start early in order to maximize its benefits and effectiveness. Both parents and teachers appear to be enthusiastic and capable of supporting early STEM learning; however, they require additional knowledge and support to do so effectively. Teachers in early childhood environments need more robust training and professional development to effectively engage young children in developmentally appropriate STEM learning. Parents and technology can help connect school, home, and other learning environments like libraries and museums to support early STEM learning. Research and public policies play a critical role in the presence and quality of STEM learning in young children’s lives, and both benefit from sustained dialogue with one another and with teachers in the classroom. 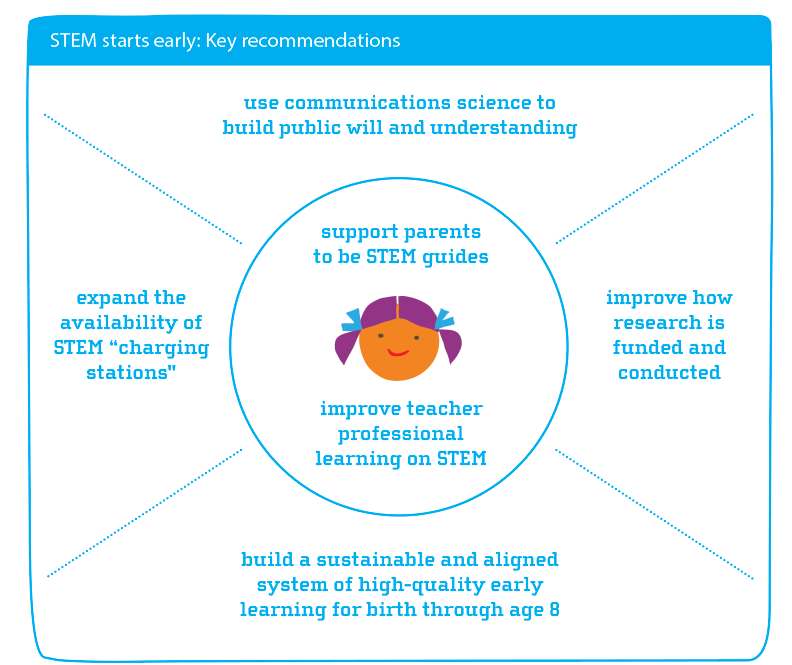 An empirically-tested, strategic communications effort is needed to convey an accurate understanding of developmental science to the public, leading to support for meaningful policy change around early STEM learning. So why is STEM not woven more seamlessly into early childhood education? What can we do—in the classroom, in homes, in museums, in research labs, and in the halls of legislating bodies—to ensure that all young children have access to high-quality STEM learning early in life? Small and large steps can be taken, both sequentially and simultaneously, to advance greater STEM learning in early childhood. Engage parents: Support parent confidence and efficacy as their children’s first and most important STEM guides. Support teachers: Improve training and institutional support for teaching early STEM. Connect learning: Support and expand the web of STEM learning “charging stations” available to children. Transform early childhood education: Build a sustainable and aligned system of high quality early learning from birth through age 8. Reprioritize research: Improve the way early STEM research is funded and conducted. STEM Starts Early: Grounding science, technology, engineering, and math education in early childhood is available as a free download today.